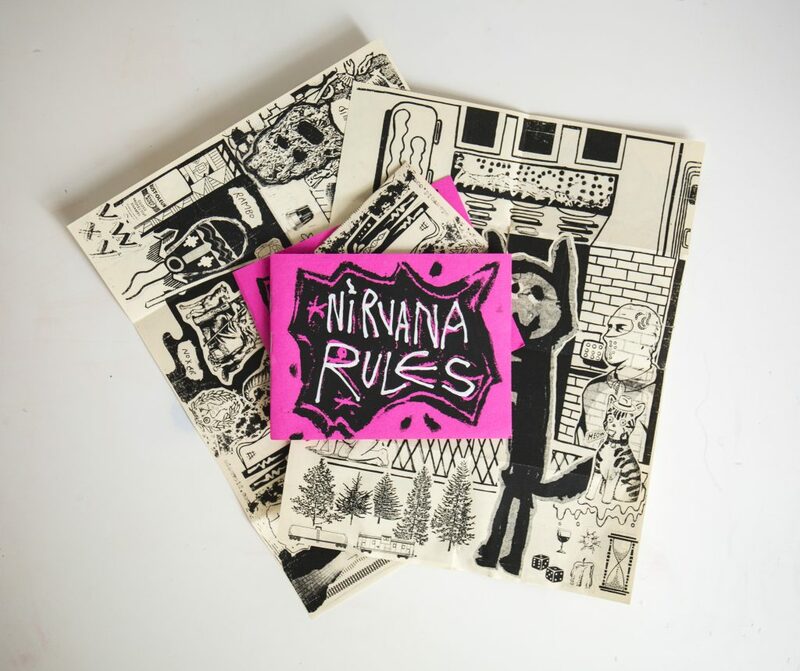 Nirvana Rules is the latest of offering from among the many zines Adam Void has made. The title gives a clue to the content within which focuses on the ‘Nirvana Rules’ tag he first noticed on the streets of Baltimore. The graffiti is unconventional, both in its form and style, yet being well-executed and repeated often this clearly isn’t just a series of spontaneous tributes left by random Nirvana fans. In the introduction to the zine Adam Void points out that it’s not unusual to see a popular band’s name on a wall. Fans of various bands eg; Kiss, Iron Maiden, or Slayer seem to enjoy slapping a bit of emulsion on brick or writing on a toilet door. However the Nirvana Rules tag appears to be unique in that it has a dual function as one person’s tag. 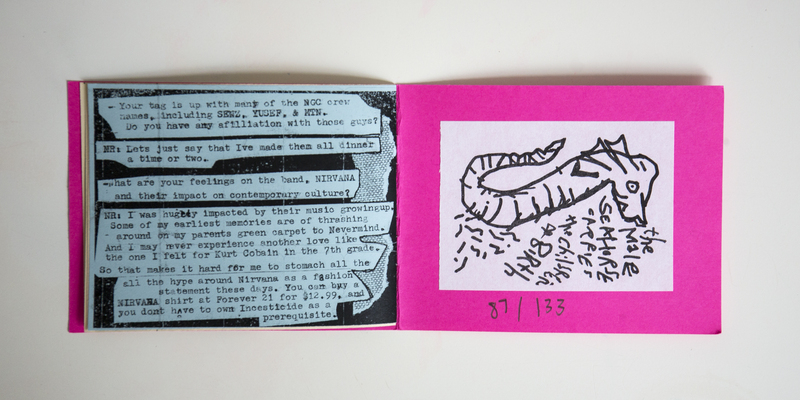 Presented over the pages of the zine, in black and white, the tag is shown to have a clear aesthetic being placed on a variety of surfaces and mediums. In a similar way to the Guerrillero Heroico image of Che Guevara, Nirvana have also been co-opted as an overused branding image. In that sense anyone who sees Nirvana Rules will instantly recognise it. Unlike an overstylised tag that the average member of the public wouldn’t be able to read let alone relate to. However, reclaimed from the surface of a black t-shirt and re-interpreted in a different way Nirvana Rules takes on a new form. 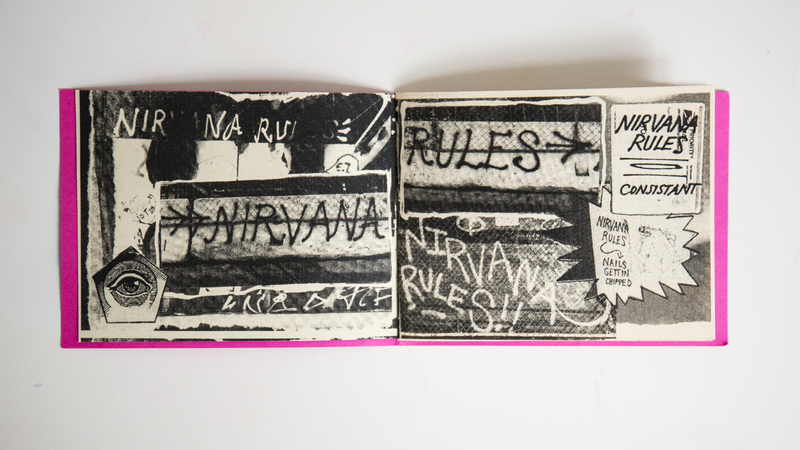 The final pages of the zine contain an interview with the actual Nirvana Rules tagger. As a fan of the band she finds it hard to “stomach all the hype around Nirvana as a fashion statement”. Her tag came about as a rejection of graffiti conventions rather than a statement on the band’s image though. Nirvana Rules was bored with just “watching the boys paint” and wanted to join in without adhering to the self-aggrandising ‘rules’ of graff. In keeping with this intention Nirvana Rules has never produced some complicated wild style at a legal spot and remains an honest tagger. So there’s plenty to keep an eye out for!